This is a 5k ‘runseeing’ tour of Geneva’s tourist highlights, focused on the most important sights in the older part of the city, on the south side of the Rhône. We’ve created this specific route, but use it as a guideline to create your own. 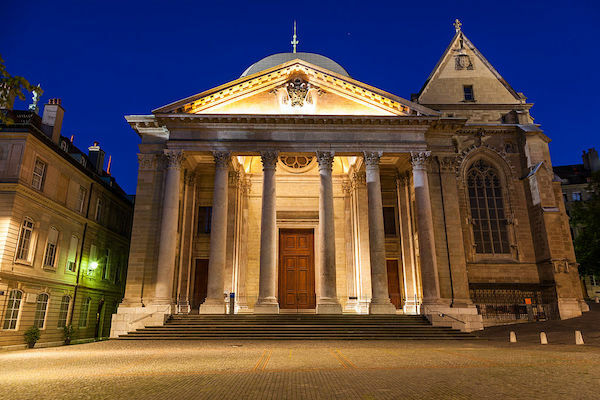 We start the tour at the St. Pierre Cathedral, most famous as the adopted home church of Protestant Reformation leader John Calvin, and next to the Museum of the Reformation. There’s sort of an elevated passage you can run here. Off the Place de la Madeleine, LEFT on the Rue de la Croix d’Or, toward the Temple de la Fusterie. Then head down toward the water, and run east along the Promenade, to the Jardin des Anglais, to see the famous flower clock. Depart the lakefront path and run to the Museum of Natural History, using Rue Adrien-Lachenal. At the museum, take a RIGHT on Ferdinand-Hodler, to Observatory Park, which at a bit of elevation has great views, and some steps for running. Run through the park, by the Musée d’Art et d’Histoire (Geneva’s largest museum), along the Esplanade Théodore-de-Bèze. 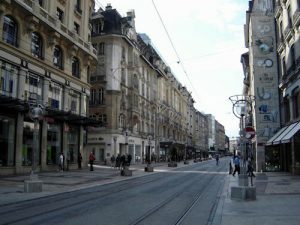 Then run along the Rue Chaudronniers, to the famous Bourg-de-Four Square shopping area, continuing west for a jaunt though the lovely campus of the University of Geneva and the Parc des Bastions. Then head north, toward the water, along the Boulevard du Théâtre, to the Place de la Synagogue. and then RIGHT along Strand, to the Rue de la Cité, where you’ll turn right and run along this main shopping street back to the start. Add-Ons. For a pleasant add-on, do a ~1 km tour of the Place de L’Ille, a waterfront island with numerous quais and bridges connecting to the north side of Geneva. See the landmark Tour de l’Ile and iconic Cité du Temps event space. You can even spend some time running some of the streets of the north side, which features lots of shops, restaurants, and hotels. Of course you can also add mileage along the river and lake paths.